I am pretty excited to announce the first public release for EspressoReader is now on the Adobe AIR marketplace. 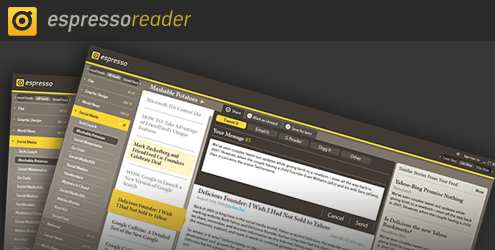 Like I had mentioned in my last post, EspressoReader is a desktop client for Google Reader that I have been working with Alex for a while. While the application is pretty functional right now, there are a lot of cool features I have in my head that will make it truly a awesome experience. I was pretty bored of the uninspiring (though functional) UI of Google Reader. A lot of my feeds would contain duplicate content (say every time Facebook added a new feature, it would be reported by Mashable, Techcrunch, etc). So Espresso loads the feeds ahead of time in a local database and parses them to find duplicate content and shows them as related items in the related items sidebar (only if you are in the List view of the application though). Navigating to the feed I wanted to read using the Tree control on GoogleReader was fairly tedious. Espresso also does a good job navigating a through your feeds using “quick jump”. At any point when you are using the application, you can hit the spacebar and bring up a textfield that’ll let you jump to any feed or folder you have in your subscriptions. Sharing stories on Twitter was a chore in Google Reader. In Espresso, you can just hit the share on Twitter button and the twitter status field comes up immediately. The splash screen that you see when you launch the application needs a lot of work. Friends’ Feed doesnt currently show the person who shared the item and the links open in your default browser. Going forward this will be better integrated into the application itself. Links right now open in your default browser. This will change and there will be an integrated web browser (with a setting to open links in your default web browser). etc etc. If you have any other ideas/suggestions, please leave a comment on this post.Â I am really looking for feedback on this release. If you are on Twitter, you can follow me or espressoReader for details on updates etc. I have also started a wiki to list the features/todos/help which is pretty bare right now but will hopefully grow as time progresses. Hats off Arpit, I just loved your reader. Thanks for it. I was wondering if it’s possible to add the functinoality to choose the specific fonts that one wants to use with the app. @Narinder Some content on the app is skinned in CSS so some support is possible (like for the main content space in the list view). I’ll add it to our backlog as a user controlled feature. I haven’t found a way to mark items as read. That’s a major flaw. @Ben, agreed. Thats one of the main features that I plan on releasing this week. Good to know that they released it on Adobe AIR Marketplace. I was hoping this application would be touchscreen friendly, as i use a Windows 7 tablet. The interface is very nice and most areas are easy to tap with a finger , however i had to uninstall because there was no way to drag-scroll. i had to fish around for the tiny scrollbar. I guess this is a limitation of Adobe Air itself. I use Google Reader on Firefox because of all the handy add-ons available to that browser. I love Feed Demon and am very interested in this new app, but… the only reason I would change from the main Google Reader/Firefox mix would be if Espresso somehow allowed direct Firefox integration IN the main software. Say, you can open any relevant link directly in Espresso through a Firefox-addon powered window or tab, not open Firefox itself. I know this is too much to ask, but well… such is the thing.